Nine games of league play have come and gone and now just nine games remain until we get to the “Madness” that is the NEC Women’s Basketball Tournament coming up in March. As teams prepare to return to the courts this weekend for the first time in a week to begin the second half of their conference schedule, we wanted to take a moment to look at the landscape here at the halfway point and try to narrow down some of the top candidates for the end-of-the-year awards. Not necessarily to pick out specific mid-season winners, but to shine a light on the few players who we should be talking about and keeping an eye on, for each category, here in the second half. At this rate, Robert Morris head coach Charlie Buscaglia is going to need to get a whole new wing built onto his house just to store all of his Coach of the Year awards. In two years as the Colonials head coach, Buscaglia took home Coach of the Year honors both seasons, becoming the third coach in NEC women’s basketball history to win the award in consecutive campaigns. In 2017, RMU won 22 games and the NEC Championship. In 2018, Buscaglia led RMU to a program record 25 wins and an appearance in the WNIT. While no coach has ever won the honor three straight years, Coach B is making an incredible case to be the first. In 2019, his team has been focused, consistent, balanced, and especially dominant on the defensive side, on their way to a perfect 9-0 league start. Also to be strongly considered should be St. Francis Brooklyn’s Linda Cimino. In just her first season, Coach Cim has St. Francis Brooklyn at 12 wins overall (One win shy of matching their total from all of last year), and 6-3 in conference, which is good for a share of second place. She successfully inserted her up-tempo system, leading the Terriers to stand atop the league in scoring. She took a solid core group of returning players and have them putting up their best numbers. In addition, her arrival to Brooklyn Heights helped lead Ebony Horton and Dominique Ward to the program, who have both been key contributors to the Terriers 2019 success. Finally, a third mid-season contender would be Jessica Mannetti, who won Coach of the Year back in 2016. Mannetti’s Pioneers burst out to a 6-0 start in league play before dropping their last three. It can be a blessing to have such a veteran roster at your disposal, but also a challenge to keep them learning and improving each day. After spending time with Sacred Heart for our column last week, I could see firsthand that Coach Mannetti has done a great job putting an emphasis on her players getting better each day and being great teammates, leading to very strong team chemistry and a great team culture. LIU Brooklyn’s Brandy Thomas came out of the gate super strong, recording a double-double in her first seven straight games to start her career, and averaging a double-double for most of the season. Thomas currently leads the Blackbirds in rebounding and is second on her team in scoring behind a Rookie of the Year contender from a year ago, Jeydah Johnson. While Emilija Krista Grava has missed the last three games for the Seahawks, her numbers from the entirety of the first half of the season give her a well-deserved seat at the mid-season All-Rookie table. The Wagner freshman won an early-season Rookie of the Week honor back in November and has averaged 12 points over her last eight games played, including a career high 19 points on January 14th against FDU. When RMU sophomore Megan Callahan went down earlier this season due to injury, freshman Isabella Posset stepped up into her place and the Colonials haven’t missed a beat. Since entering the starting lineup in mid-December, Posset is second on the team, averaging 8.8 points per game. The Beaver, PA product is a three-time NEC Rookie of the Week, and leads the 9-0 Colonials in minutes played and assists, while standing second in steals and blocks. Finally, Mount’s Michaela Harrison is a four time NEC Rookie of the Week, and leads all freshmen in scoring this year with 12.4 points per game. After hitting a small “freshman wall” in December, Harrison made the proper adjustments, and has been on a tear. Harrison reached the halfway mark in NEC play riding an eight game streak of games with double-digit scoring, averaging 15.5 points per game during that run, and is coming off of an afternoon in which she tied a program record with eight made threes in a single game. Harrison holds a four to three lead over Posset in Rookie of the Week’s this season. Keeping an eye on the weekly honor over the next month could end up providing a major clue as to who will end up with this award at season’s end. The last time a player had the most Rookie of the Week nods during the season but did not win the Rookie of the Year award was in 2013 when Wagner’s Jordyn Peck tied RMU’s Ashley Ravelli for the most, and Ravelli ended up taking home the honor. Most Improved Player is the NEC’s newest award, first awarded during the 2015-16 season. It’s also one of the most difficult to forecast at the halfway point, since there could be a chance that the outstanding improvement that would merit winning this award is either in the process of happening or hasn’t fully materialized yet. However, three players who we can point to at this time who are almost assured of at least being in the final discussion are SFU’s Haley Thomas, St. Francis Brooklyn’s Ally Lassen, and Wagner’s Taylah Simmons. Simmons enjoyed a solid redshirt-freshman campaign last year, finishing third on the Seahawks in points and assists. This year Simmons has stepped up to take over the lead role, leading the team with 14.4 points per game. In league play, she has been even better. Simmons ranks third in the league with 18.9 points per game against NEC foes, with only Jess Kovatch and Jade Johnson ahead of her. Lassen played in 23 games last year as a freshman, but only averaged five minutes a game and scored 11 total points for the entire season. This year, Lassen has contributed 8.8 points and 5.1 rebounds, making the most of her increased opportunities under Coach Cimino, averaging 17 minutes more court time. The Point Pleasant, NJ native was a frequent target for Amy O’Neill to feed in the post and lead to the basket back on January 21st in the Battle of Brooklyn, where Lassen netted 16 points. Last year, Haley Thomas played 22 games with 14 minutes per game off of the bench for the NEC champion Red Flash, averaging 3.4 points and 3.6 rebounds. Thomas has grown in confidence with a larger role this year and has been a versatile weapon for interim head coach Susan Robinson Fruchtl, joining the starting lineup back on December 15th and averaging 11.6 points per game since. Thomas exploded for a career high 23 points against LIU back on January 12th, and over the last four games, she has been a double-digit scorer, averaging 15.8. Not to mention, Thomas has been nearly automatic from the free throw line this year, going 50-52 (96.2%), which would be second best in the country, however she falls just a few attempts shy of qualification. One other interesting case to explore would be Sacred Heart’s Kat Haines who already won Most Improved Player and was in the Player of the Year conversation back in 2017. Last year, Haines battled injury and saw her level of play take a small dip from the outstanding year prior. However, as Coach Mannetti told us last week, this year Haines has stepped out of her comfort zone more than ever, been more vocal, and mentally tough. The SHU grad student is producing the best numbers of her career with 15.9 points and 9.1 rebounds. You could make the case the jump from where she was last year to the level of play she has been at this season is definitely ‘most improved’ worthy, however I’m not sure how receptive voters would be to vote for the same person to be Most Improved Player twice in a three year span. It would be an interesting conversation to have nonetheless. Defensive Player of the Year is always a difficult award to forecast, since it all depends what you are looking at. Steals? Blocks? Rebounds? On the ball defensive skills that don’t show up in the stat sheet? Looking at each one of those categories could produce a different name. To start, without question, Robert Morris has been the best defensive team, however the whole team can’t win the award. The best defensive player on the best defensive team is quite possibly Nneka Ezeigbo who leads the team in rebounding, blocks, and steals. If you look elsewhere, FDU’s Natalie Zamora, Wagner’s Nakylia Carter, and St. Francis Brooklyn’s Amy O’Neill are among the league leaders in steals, while SFU’s Courtney Zezza and SHU’s Katherine Haines top the leaderboard in blocks. After speaking with several coaches over the last two weeks about the best defensive player(s) in the league, this seems to be the most ‘up-for-grabs’ award going into the second half of the season, with no clear consensus as there has been the last two years with Ace Harrison. If the middle of the conference season was two weeks ago when Sacred Heart was 6-0 and Kat Haines was coming off a triple-double and her 1,000th career point, she would have been the leader in the clubhouse, however her and her team’s struggles over the last three games have allowed other candidates to step up and state their case. This fluidity over just the last two weeks perfectly illustrates how up-for-grabs this award will be in the second half, possibly coming down to the final weekend of games. One such candidate who has improved their case over the last two weeks is the reigning NEC Player of the Year Jess Kovatch. With Saint Francis operating a slightly different tempo on offense than last year, Kovatch’s numbers aren’t as strong, however numbers not as strong for Jess Kovatch are still pretty outstanding when compared to others. The NEC’s all-time leading scorer has led SFU in scoring the last 16 straight games, and over the last two weeks has averaged 29 points per game, including back to back 30 point performances. While winning consecutive Player of the Year honors is rare, it has happened three times, most recently in 2013-14 with Artemis Spanou. Jade Johnson stands second in scoring, behind Kovatch, but has been more efficient, making 44% of her field goals and 45.5% of all threes. Holloway is the only NEC player currently averaging a double-double, while leading the NEC in rebounding with 12.2 per game. Finally, Lawless has been a top three scorer, while guiding a young Mountaineer team to their greatest start to a season in quite some time. The second half of conference play gets underway on Saturday afternoon, February 9th. The actual NEC award winners for 2019 will be announced prior to the start of the NEC Tournament in early March. Still plenty of basketball left to decide who will be #NECElite for 2019 and walk away with the official hardware! *WHERE THEY STAND: The Robert Morris Colonials became the ninth NEC team since the turn of the century to start a conference season 9-0 when they defeated Fairleigh Dickinson 63-43 last Saturday. The Colonials are the second NEC team to begin 9-0 in back to back seasons, behind the Saint Francis Red Flash who started three straight seasons 9-0 from 2002-04. The Colonials, who are in search of their third straight regular season championship and fourth in the last six years, have opened up a three game lead at the top of the standings. Believe it or not, Robert Morris will already have a shot to become the first team to officially punch their ticket into the 2019 Northeast Conference Women’s Basketball Tournament this weekend based on their results against Bryant and Central Connecticut, as well as other results from around the league. With their overtime victory at Sacred Heart last weekend, St. Francis Brooklyn forced a three way tie for second place in the standings, with the Terriers, Pioneers, and Red Flash all even at 6-3 in league play. The Red Flash have won three straight to make up ground, taking advantage of a Pioneer three game slide. Two games outside of the top four, sit Mount St. Mary’s, Bryant, and Wagner, who are all tied at 4-5. The trio is only game ahead of Central Connecticut and Fairleigh Dickinson, who are tied at 3-6 for the eighth and final playoff position. *THE ONE AND ONLY: On Saturday afternoon in Emmitsburg, MD, Saint Francis Red Flash senior Jessica Kovatch collected the only real notable Northeast Conference scoring record that was still left out there for her to achieve. With her fourth point of the game, coming in the first quarter on a free throw, Kovatch surpassed former Wagner men’s basketball star Terrance Bailey as the NEC’s all-time leading scorer. Bailey, who played for Wagner from 1983-87 and earned a place in the NEC Hall of Fame, recorded 2,591 career points, holding on to the top spot in the league record books for the last 30-plus years. Kovatch now has accumulated 2,622 career points, more than any student-athlete who has suited up for a Northeast Conference basketball game over the last 38 years, and still has (at least) nine games in her career left to play. The Red Flash will return to action coming up on Saturday at home against Central Connecticut State. The game will feature the special jersey ceremony honoring the former top scorer in NEC women’s basketball history, 2010 NEC Hall of Famer, Jess Zinobile. The ceremony will be part of SFU’s ongoing celebration of 50 years of female athletics at Saint Francis. *TERRIER TRIPLE-DOUBLE: On Saturday afternoon, Amy O’Neill helped lead St. Francis Brooklyn to an overtime win at Sacred Heart by recording 13 points, 13 rebounds, and 12 assists in 44 minutes of action – recording the first triple-double in St. Francis Brooklyn women’s basketball history. The senior point guard has flirted with the feat on several occasions this year, including: 9pts/11reb/8asst vs. LIU, 20pts/9reb/9asst vs. SHU, 15pts/8reb/8asst vs. Albany, and 12pts/11reb/9asst vs. Loyola. O’Neill’s triple-double becomes the 12th in league history, and the second recorded this season. Ironically, it was in the previous Terrier/Pioneer game back on January 19th when Sacred Heart grad student Katherine Haines had 25 points, 15 rebounds, and 11 blocked shots, recording the first triple-double in Pioneer history. 2019 becomes the second season in NEC history which has seen multiple triple-doubles. The first, back in 2008, saw Robert Morris’ Chinata Nesbit record both of the triple-doubles herself, including one in the NEC Tournament. *BLUE DEVIL BUZZER BEATER: Central Connecticut State won their second straight game and third game in their last five, in thrilling fashion on Saturday with a buzzer-beating 66-65 victory against Bryant. Trailing by double figures entering the fourth quarter, Central managed to chip away at the deficit and find themselves tied at 61 with two minutes to play. Thirty seconds later, senior Kiana Patterson would give the Blue Devils their first lead since early in the third quarter with a jumper to make the score 63-61. Bryant ended a six minute field goal drought with a Kiera Palmer three pointer to stun the Detrick Gym crowd and give Bryant back control with 18 seconds left to spare. After a Sydney Holloway steal, she was intentionally fouled. Holloway made one of two from the line to give Bryant a 65-63 advantage. Hannah Scanlan was then fouled with five seconds left, but she came up empty on a pair of free throw attempts, keeping Central alive, and setting the stage for the game-ending dramatics. Following a timeout, Blue Devil senior Andi Lydon inbounded to Kiana Patterson in the left corner, whose three-ball was off the mark, but caromed hard off of the rim and back out to the top of the key, back to Lydon. Lydon quickly flipped the ball over to her right and junior guard Bruna Vila Artigues, who banked in the trifecta as time expired, giving the Blue Devils the 66-65 win. Artigues scored a career high 13 points on 5-7 shooting, and 3-4 from beyond the arc, with six rebounds and four assists. The Blue Devils will look for their first three game win streak of the season when they travel to Pennsylvania to meet the reigning champion SFU, a team they beat by 11 points last month. For the first time in a week, Northeast Conference women’s basketball teams will return to the hardwood on Saturday to tip off the second half of the league schedule. Saturday’s slate will feature a national broadcast double-header, starting in Fairfield at noon with Mount St. Mary’s visiting Sacred Heart and finishing up in the Keystone State as Bryant meets Robert Morris at 7pm. The Mountaineers and Pioneers will be a matchup featuring two teams who had a ton of momentum, lost it, and now will be trying to get it back. Sacred Heart had won six straight to start NEC play before dropping their last three in a row, including last weekend’s home overtime loss to St. Francis Brooklyn. Mount had won three straight, and four out of five, before falling to Saint Francis U at home last Saturday afternoon on ESPN3. One fascinating element to watch for is with the pace of play. Mount averages the most possessions per 40 minutes in the NEC at 72.8, while Sacred Heart averages the least at 67.9. The Pioneers want to move faster and should have the opportunity on Saturday. The Pioneers have played smart and efficient, only turning the ball over 13.8 times per game (fewest in NEC) and are sporting the second ranked scoring defense in the league, only giving up 62.8 points per game. To contrast, the Mount score 69 points per game, while shooting at 40%. The Mountaineers, with their extra possessions gained by moving at their pace, also attempt 26.3 three pointers per game, which stands as second most in the NEC. After averaging 68.3 points on 40.9% shooting during their six game run to start league play, the Pioneers have only managed 55.7 points on 33.1% shooting during their current three game skid. Another noticeable difference is Sacred Heart boasting the experience factor of three grad students, two seniors, and no freshman, while the Mount is almost entirely made up of underclassmen. The major exception is Mount’s standout senior Juliette Lawless, who stands third in the league in scoring, and will look to bounce back after a disappointing eight point performance last week against SFU. SHU’s overtime loss to the Terriers at the Pitt Center last weekend ended a run of nine straight home wins in conference play. Sacred Heart will enter the weekend holding a two game lead over Mount in the league standings. Saturday’s game will be broadcast live on ESPN3 beginning at noon with myself and Pam Roecker on the call from the Pitt Center. But the action doesn’t end there! To close out the evening, longtime rivals, the Bryant Bulldogs and Robert Morris Colonials, will renew acquaintances at the North Athletic Complex in Moon Township. This will be a rematch from a game back on January 19th in Smithfield, won by the Colonials 60-57. Leading by two, and with 33 seconds left, RMU’s Nadege Pluviose blocked Bryant’s Sydney Holloway’s game tying attempt. After RMU split a pair of free throw tries, Bryant had one final shot to extend the game and force overtime, but Holloway’s three point attempt swirled around the rim and just out as time expired. The Colonials will be looking to match the 2016 Bulldogs with the fifth best start to a conference season since 2000 at 10-0. That 2016 season was the third year, in what would go on to be a four consecutive year stretch, where Bryant would have their season end at the hands of Robert Morris in the NEC Tournament. Robert Morris continues to lead the league, and stand among the nation’s leaders, in scoring defense (55.9 points per game), field goal percentage defense (37.2%), and turnovers forced (20.4 per game). 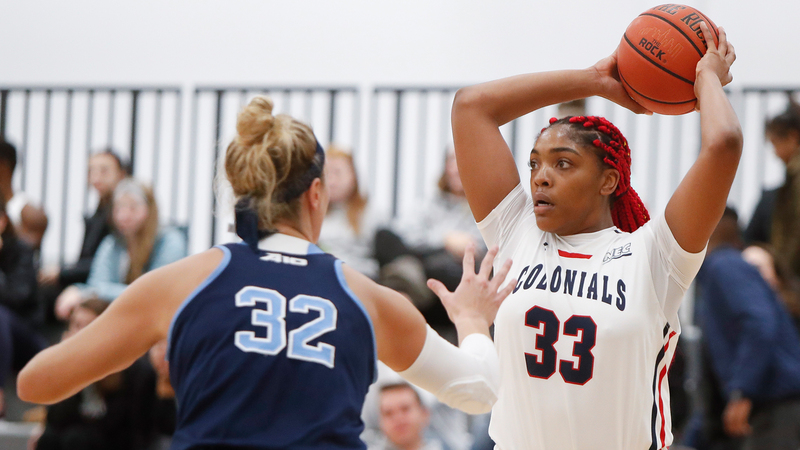 On offense, nine different Colonials have taken turns leading the team in scoring, however as of late, Nneka Ezeigbo has been a growing force. Going back to the previous meeting with Bryant, where she led the team with 12 points and eight rebounds, Ezeigbo has averaged 13 points and 9.6 rebounds over her last five outings. Bryant has suffered three single possession losses in league play this year, including a heartbreaking loss at the buzzer last weekend at Central Connecticut. Sydney Holloway has recorded three straight double-doubles, and 13 overall on the season, for the Bulldogs. The veteran crew of Paul Dottino and Karen Hall will be on the call from Moon Township, with the tip time set for 7pm on ESPN3. THREE: Taylah Simmons, R-SO (WC): Wagner redshirt-sophomore Taylah Simmons has been on a tear since the calendar turned over to 2019, averaging 18.9 points and 6.3 rebounds in league play. Simmons’ scoring average in NEC play ranks third in the league. After recording a career high 28 points two Saturday’s ago against Mount St. Mary’s, Simmons led the Seahawks with 27 points and 15 rebounds this week against LIU Brooklyn, with 19 of her 27 points coming in the second half. TWO: Jess Kovatch, SR (SFU): Red Flash senior Jess Kovatch once again rose to the occasion in the ESPN3 spotlight on Saturday, scoring a season-high 34 points against Mount St. Mary’s. Kovatch struggled from the field early, but still managed to surpass Wagner’s Terrance Bailey for the NEC’s all-time scoring mark on a free-throw in the first quarter. Overall, Kovatch cashed in on 14 of her season high 16 free throw attempts. She would go on to shoot 7-17 from the field on the afternoon, with six of the seven made field goals coming from beyond the arc. Kovatch continues to pace the league, and sit top 10 in the nation, averaging 22.1 points per game on the year and 24.8 points per game in conference play. ONE: Amy O’Neill, SR (SFBK): After several close calls earlier this year (9 points, 11 rebounds, & 8 assists vs. LIU…20 points, 9 rebounds, 9 assists vs. SHU…15 points, 8 rebounds, 8 assists vs. Albany…and 12 points, 11 rebounds, 9 assists vs. Loyola) Amy O’Neill finally recorded a triple double on Saturday in the Terriers overtime win against Sacred Heart. O’Neill played 44 minutes and finished with 13 points, 13 rebounds, and 12 assists, including the game winning dish to Dominique Ward in the final seconds of overtime. The triple double is the first in St. Francis Brooklyn history, 12th in Northeast Conference history, and second recorded in the NEC this season. Join us back here at the NEC Overtime! Blog next Wednesday, February 13th for a brand new WBB Fast Break column, featuring Mount St. Mary’s senior guard Juliette Lawless. Craig: Everytime you contribute to NEC Overtime, it’s always a very thorough, comprehensive and entertaining read. Coverage of women’s basketball, especially of the NEC, is so tough to find. And recruiting coverage beyond the major conferences is practically non-existent. That might be an excellent area to cover during the WBB off-season. Please keep up the outstanding work!